Whether we are conscious of it or not, the way we teach mathematics is very much influenced by what we conceive mathematics is and what is important knowing about it. As part of our Lesson Study project with a group mathematics teachers, I was tasked to share my thoughts about the nature of mathematics and its implications to its teaching and assessment. 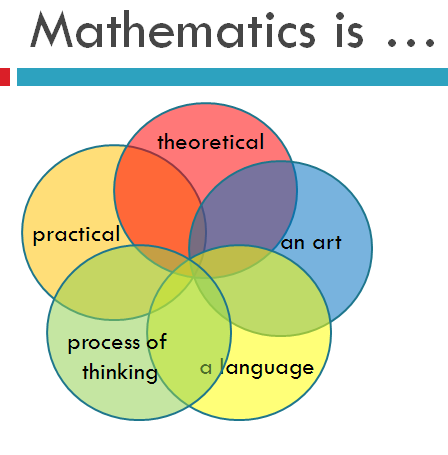 I have always believed that mathematics should be experienced by the k-12 market as both practical and theoretical, as a language, as a process of thinking and, as an art. Of these five, I have always felt the least confidence in speaking of mathematics as an art because I don’t really know what art is. Most of the times, my “mathematics is an art” becomes “there is art in mathematics”. The latter is much easier to discuss because teachers know this so there’s not much need for me to explain. I don’t even need to pretend I know something about art. What I do and I don’t know if I get away with it, is to put it at the end of my presentation, like an afterthought, with beautiful examples. Here are two of them. Click image to get to the source. Where there is art, there is beauty. And what is the beauty of mathematics? In most cases, it’s in patterns. I would regale teachers with patterns in nature that mathematics could perfectly represent and capped my lecture with Galileo’s pronouncement that Mathematics is the language used by God to write the universe. 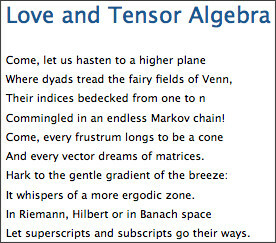 With this, I could get away from mathematics as art to mathematics as language. Then I came across this post titled What is an art? which defined art as a habit of thinking, doing, or making that demonstrate systematic discipline based on principles. The post described arts as about connections and that understanding the connections between things allows designers to accomplish their goals. It described art as based on principles and not just a series or procedures or methods; that there can be many methods inside an art … Finally, and I love this part, it said that art must be acquired as a habit, so that its practitioners become “unconsciously competent.” I checked Wikipedia if these descriptions do not run counter to its definition of art and it did not. I thought the post could very well be speaking of teaching and learning of mathematics especially in its giving importance to making connection, open-ended problem solving, and the acquisition habits of mind which are favorite topics of mine when I’m invited to share my thoughts about mathematics teaching. In my next post on this topic I will share some tips on how we can structure teaching to show the beauty of mathematics not only in its results but in its method.